Made by Smith, Richard Bartholomew in Australia, Oceania, 1887-1889. This large-scale (1:5) working model is a reproduction of the original astronomical clock in Strasbourg Cathedral in France. The clock is made from carved and painted wood with gold painted detailing. The clock displays the position of the planets out to Neptune, the days of the month, solar time, lunar phases and analog time. 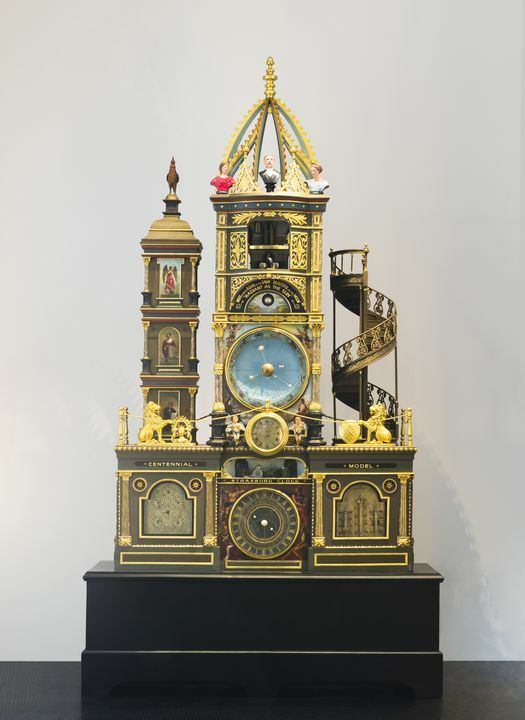 The Strasburg Clock model was made by Richard Bartholomew Smith (with help from many other persons) between 1887 and 1889 in Australia. Richard Bartholomew Smith (1862-1942) sold the clock to the New South Wales Government in late 1889 or early 1890 for the sum of 700 pounds. The clock was initially housed in the Technological Museum in the Domain, but was transferred to Ultimo when the Museum was opened in new premises on Harris Street on 4 August 1893. The clock remained in the old Harris Street Museum for about 90 years, enthralling and disappointing generations of visitors, with its stop/start mechanisms until it was dismantled in the early 1980s and refurbished for inclusion in the new Powerhouse Museum, which opened in the restored Ultimo Power Station in March 1988. The clock was on display when the Museum first opened in March 1988. It was placed on display at the western end of the Wran Building, and was officially 'launched' on 27 January 1989 by Rear Admiral Sir David Martin, Governor of New South Wales. After a short period, it was found that the clock was ill-suited to this location, as it was thought that vibrations from heavy-vehicle traffic in Harris Street affected the clock's timing mechanisms and hence the various automata either did not work or were delayed. A solution to these difficulties was had by relocating the clock to the southern end of the Wran Building in the early 1990s, and it remained there throughout this decade, until the clock was again dismantled and removed into storage for repair. This was necessary because the clock was due for another major refurbishment and it was also decided to build a cafe in the location where the Strasburg Clock was located. Between 2002-2005 the clock remained in the Museum's workshop and Conservation Laboratory, where it was dismantled and repaired. The clock was put back on display near the Boulton and Watt engine and opened to the public on 4 October 2005. This object is currently on display in Strasburg Clock at the Powerhouse Museum.